The third edition of this ICSA Guide continues to provide comprehensive advice and guidance on the law and best practice relating to the retention and storage of key business documentation. Combining law and practice with procedure and best practice, the Guide includes guidance on retention policies and schedules, the need for review and disposal and coverage of factors that influence document retention such as risk assessments and data protection. The second part of the Guide provides retention tables for a range of regulatory areas, including company compliance, health and safety, contracts and property. 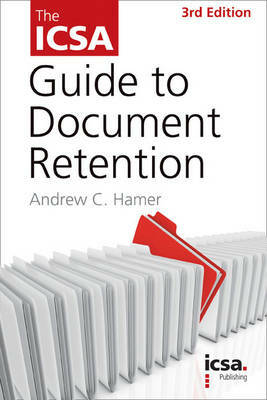 Each table makes recommendations for document retention periods based on legal requirements and good commercial practice. The new edition has been updated to reflect the latest law and regulation, including case law and new standards relating to electronic storage.